RCC (Reinforced Cement Concrete) is a construction technology which evolved with the evolution of different structural materials in the 18th century during the Industrial Revolution. Industrial Revolution brought in new technology which helped in the manufacture of various materials. The Architect Le Corbusier used RCC for various constructions. He believed that any shape and form was possible; if RCC is to be used. 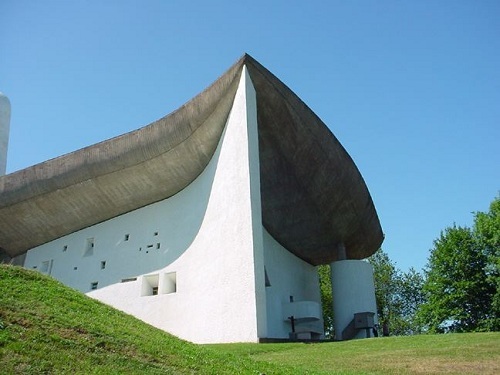 This is an example of Le Corbusier Project where he used RCC like plastic. RCC means Reinforced Cement Concrete, i.e., cement concrete reinforced with steel bars, steel plates, steel mesh etc to increase the tension withstanding capacity of the structure. Cement Concrete can take up immense compression but weak in tension whereas steel is good in withstanding both tension and compression. Materials used in RCC construction are easily available. It is fire resisting and not attacked by termites. It is economical in ultimate cost. The reinforced concrete member can be cast to any shape because of the fluidity of concrete. Its monolithic character gives much rigidity to the structure. Cost of maintenance is nil. Scrap value of reinforced members is almost nil. Skilled labour is engaged in the work. The advantages of RCC outweigh its disadvantages. This is one construction technique that made construction very easy and brought a boom to the field of construction. We have already discussed and studied the design procedures for the “Components of RCC structures”. Every component is designed according to the load it carries and its position in the structure. The study of the design of RCC components will help in understanding the basics of RCC design and the method of its implementation. I am very interested to know the building infromations and related studies. I completed DCE and would like to update my knowledge on civil work. would like to associate and do projects. Want to be very creative. I like the thumb rules that was a great update likewise some I would like to update to understand that i am doing right in my project and create a great true feel and worth feel for our clients that they are working with right person. I want to give quality building for my clients even thou my cost just meets the building construction. I want to invest my name first and then our God will show the path of success. Looking forward for a supportive feed face to improve in our life. Work hard. And all the best for your future! AM SO HAPPY FOR THE INFORMATION THAT ARE BEING PROVIDED. i am a civil engineer and i like rcc projects. I am Happy to know this site and got knowledge of Civil engineering and required Design Analyses for all framed structure building. Reinforced cement concrete is something I rarely encounter as an electrician, but running electricity in them is pretty tough and requires a lot of planning during renovations.